Those among us who do not have all their senses intact, exist in a parallel universe. A fortunate person like me can only imagine what this universe is like. No matter how deep our empathy, our cognitive abilities prevent us from experiencing their reality. I come from a family that has been involved in education at different stages. My grandfather was a Head Teacher for a period of 26 years at two different schools in our native village of Sidhpur in North Gujarat. His pedagogical style reflected in his interactions with his grandchildren, the letters he wrote to us, his style of speaking and sharing, and manifested especially strongly when his grown-up students visited him in his old age. I also have quite a lot of direct experience with hearing impaired students. My mother works as a special educator for such children, and I’ve grown up in a house that my friends termed a practical school. These experiences have moulded my persona and stayed with me no matter where I went. In my late teens I travelled to Germany for a basic degree in Astrophysics. My postgraduate education took me to France, and I later travelled to Singapore and the Netherlands for work at private companies, as well as the European Space Agency and the German Aerospace Center. As a science communications expert specialised in Space and Astronomy topics, I deal daily with the issues of science education and public understanding of science. I have a special interest in science education, especially of girls, and am investigating ways that can help turn basic science education into scientific literacy, for mothers and children, and from them, to the community and wider public. This is a grave challenge that extends well beyond the classroom. Science education begins with a tailored curriculum that includes information that is very obviously relevant to our daily lives, and also imparts information and methods that will take the students further and teach them the scientific method and mode of thinking. The latter is key to taking science education and helps turn it into scientific literacy. I am especially unaware of the mechanisms at work in rural areas in a developing country such as India, so I visited Dhanvantri school hoping for a tiny little glimpse into this world. I wanted a peek into how Dr. Shantuben Patel and her teachers deal with parents, how they sensitise and train them to their childrens’ special needs. Science education does not directly relate to this, but I have an inkling feeling that scientific literacy may be of help in opening up families and communities that would otherwise isolate mentally and physically challenged children. I have known Dr. Patel for over a year now. She has invited me to visit Dhanvantri school several times, but I hesitated, unsure whether I’d actually be able to contribute at all, afraid that I’d end up being a burden instead. While Dhanvantri School does not focus on science education, I was hoping to get a glimpse of the methods they use to reach out beyond the classroom, into the childrens’ daily lives. For that is where information turns into education, and finally literacy. I have also had my introduction to Vipassana meditation six years ago, and while I wouldn’t call myself a serious serial practitioner, it is very much a part of my life. The knowledge that these children were practicing basics of meditation also drew me to them. I was keen to witness in person the effect the practice had on them. Sitting with innocent faces in the room for just ten minutes in silence has done more for me than I would ever imagine. As I observed a normal day unfold at the school, Dr. Patel’s deep insight in dealing with each individual child and their parent, and her understanding of how each case needs to be educated and then treated, came through clearly. I got to the school without a plan, mostly because I was afraid of being associated with a world that is too far away and remote to be able to say anything relevant to these children whose concerns are far more immediate. Dr. Patel calmed my nerves when she asked me to begin by sharing my story and that of my family with the teachers. She has the foresight to see through my professional facade to a much deeper level. From her own experience, she knows that nothing is possible without a personal struggle. She wanted me to find the words and anecdotes to convey this to her staff, so that they find the strength to continue their own personal and professional exploration. I entered the room where the teachers were seated for our 20-minute meeting, heavy with the knowledge that these women were doing far more important work for our country’s future than I can begin to imagine. I shared with them about my childhood, my parents, some of their struggles in making sure that their children received a good education, and my own travel and academic as well as professional exploration. Apart from sharing a few beautiful pictures of the Moon, Mars and Saturn, I shared with them my reasons for leaving my dream job and returning to India as a freelancer, and how I was very interested in what they did, as I was trying to study the ways in which they reached out beyond the classroom. After my talk, which was met by curious and surprised faces, I thought that my work there was practically over, and I was keenly waiting for my friend Danish to arrive and conduct workshops with the students, but I was in for a surprise. I learnt a few hours later that after the teachers returned to the classrooms, the students demanded that I share with them what I had shared with their teachers. This was far more challenging. I was used to an English-speaking, computer literate audience that had its senses intact. Questions flooded my mind. How do I work these students up to become excited about space? How do I share with them the beauty of a picture of the Cat’s Eye Nebula, the enormity of Jupiter, or the desolation of the Moon? How do I convey to them the thrill of the scientific process, the thrill of enquiry, observation and discovery? I didn’t even know the names of the planets in Gujarati! I was a little less afraid about being able to reach out to the hearing impaired students, but was at a total loss otherwise. I was given about 30 minutes to put together a quick pictorial presentation. The response blew me away. The pictures were enough to hold the gaze of the younger students. As I shared how Jupiter is as massive as a thousand Earths and other such trivia, one of the teachers translated it into sign language for some of the students. The surprise in their eyes bowled me over. I showed them pictures of satellites and moons, and could see them delighted and shocked to hear that Saturn has over 60 moons, to see the red face of Mars, and the glowing beauty of the Cat’s Eye Nebula. For a science communicator working with astronomy and space – believe it or not – keeping it interesting is a challenge. My audience usually consists of English speakers with a presumed interest in space and astronomy, who are used to hearing astronomical figures and seeing pictures that are out of this world. After a while, they become too jaded to still be surprised by reality, hardened to the wonders of our Universe, and can find the slow process of scientific enquiry to be a drag. The students at Dhanvantri school were able to grasp big, heavy concepts that seasoned minds find difficult to grasp in their entirety. They intuitively sensed the power of the information and the enormity in the numbers and pictures that I was trying to convey. After describing the pictures on display, I did not need to explain further before they were able to sense what I was saying. I am hoping to come back with more teaching aids related to space and astronomy so I can take the students a step further from being just a responsive audience. The next day I also painted a little, but I am hoping to conduct a proper painting workshop the next time, to help them explore creative expression. If I write that Dr Patel and her team are making a huge difference to the area that they work in, it would be a grave understatement that belies reality. The truth is that the progress of our nation depends on people such as them. They are the ones who take literacy out of our classrooms and into households, communities, and villages. They educate the parents, give them the tools that they need to deal with the most precious little citizens: our children. They keep the most deprived and challenged of these children from exploitation and from what would otherwise be a substandard life. They are sowing the seeds of progress. This is the true face of development. And I can add one more thing safely: we need many more people like Dr. Patel in India’s villages. I have to thank Dr. Patel and her team for blowing me away with their warmth, compassion, and their ability to work with me to bring out my best effort while I was visiting. And the children, for they only offer true love and warmth in response to your every action. I will try my best to do what I can to support them, and I hope that you will too. 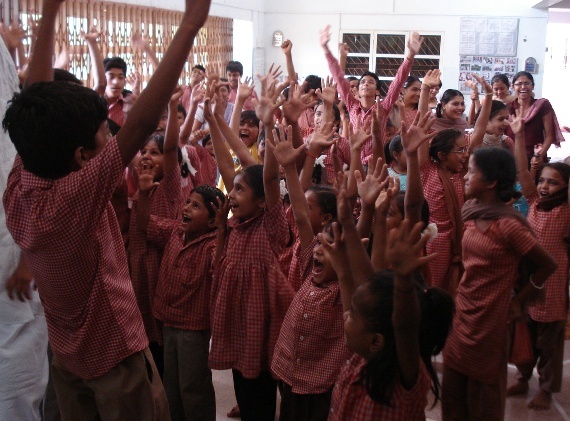 Dhanvantri school is a special school for the mentally and physically challenged. The students include children that are hearing impaired, hyperactive and cerebral palsy, among other afflictions. 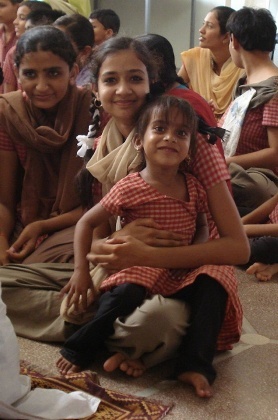 The school is managed by Dr. Shantuben Patel, a paediatrician and a neo-natologist, and a team of special educators, who set it up in response to the large numbers of mentally and physically challenged children that turned up at her doorstep as patients while she was still a practising doctor. Danish Husain’s heartfelt article on Kafila will tell you more about this phenomenal woman and her personal struggle as well as that of her dedicated team, before, through, and after the massive earthquake that hit Bhuj on 26 January 2001. 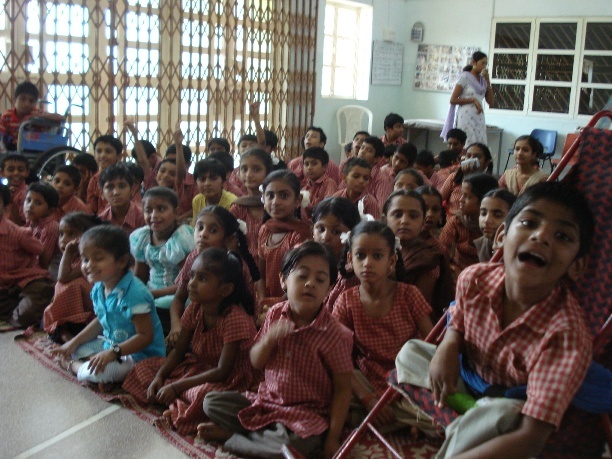 The school’s operating expenses amount to about 25 lac Indian Rupees, or approximately 60k USD, per year. It relies entirely on funds from generous donors to meet its expenses. Bhuj, Kutch, Gujarat 370 001, India. This was truly an inspiring read .Dr Patel’s work is perhaps not just challenging but also very soul satisfying.Equipping parents to handle their children and allowing special and differently abled children to create their own space in this shows selflessness and love on her part. Great post. I am hosting the Facebook Page of DHANVANTRI SCHOOL. Please LIKE the page and help to spread awareness.